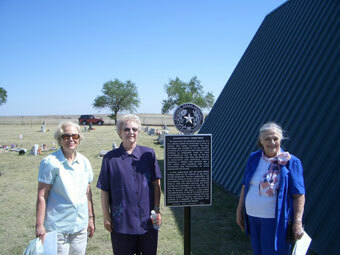 The Texas Historical Commission (THC) has recognized the Darrouzett Cemetery as a significant part of Texas History by awarding it an official Texas Historical Marker. The designation honors the Darrouzett Cemetery as an important and educational part of local history. 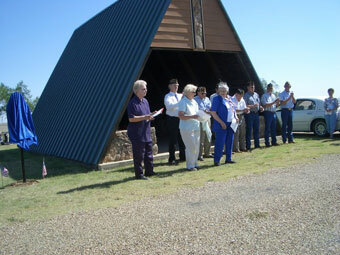 A dedication ceremony to commemorate the event was held on Monday, May 29, 2006 at the cemetery. Marilyn Robins, President of the Cemetery Board presided over the program. 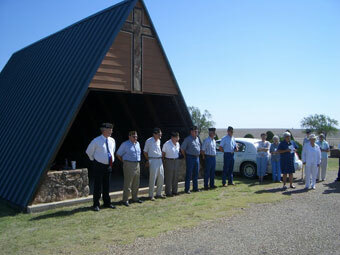 The local chapter of the American Legion presented the colors to officially open the program. Ms. Robins introduced Bette Frass McDaniel and Ella Mae Frass McGuire, descendants of Anna Frass who donated the land for the establishment of the Cemetery in 1939. She moved the graves of Henry Frass (d.1932), her late husband, and granddaughter Esther Lee Frass (d.1926) to the cemetery from Lipscomb. The first burial at the cemetery was that of David Rush in January, 1939. Ms. Robins recognized and thanked Virginia Scott, Wolf Creek Heritage Museum and Dorothy Schoenhals, the Lipscomb County Historical Commission for their program and efforts in recognizing the county cemeteries. She introduced Dorothy Schoenhals who is the leader of the cemetery designation program. Ms. Schoenhals reported that 50% of the county's cemeteries have been designated and will have markers placed in the upcoming year. The remainder of the cemeteries have their applications in progress. Ms. Schoenhals also recognized LaVaun Kraft for her efforts in documenting the names of all who are buried in our cemeteries. She and Ms. Schoenhals supervise the project to obtain markers for all our gravesites. Ms. Robins removed the cover and revealed the marker to the applause of the crowd. Upon adjournment, those present enjoyed visiting with each other and paying their respects to family and friends on this a special memorial day. Color Guard prepares for flag raising. Marilyn Robins, President of Darrouzett Cemetery Board presiding over the ceremony. Ella Mae Frass McGuire, Marilyn Robins, and Bette Frass McDaniel. Ms McDaniel and McGuire are descendents of Anna Frass who donated the land for the cemetery.